Josie Maran Coconut Watercolor Eyeshadow Beach Sand and Rio de Rose Gold. 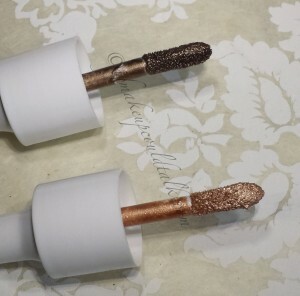 Josie Maran Coconut Watercolor Eyeshadow Beach Sand and Rio de Rose Gold ($18 USD/ 4.7 ml) are the newest creations from the “Luxury with a Conscience” creator/brand, Josie Maran. Her line of paraben, sulfate, phthalate-free products are among the best in the business. These new “bi-phase” liquid eye shadows promise to deliver hydration, long-lasting wear and healthier looking lids. Could I resist these claims? No. Will I fall in love? You’ll see. 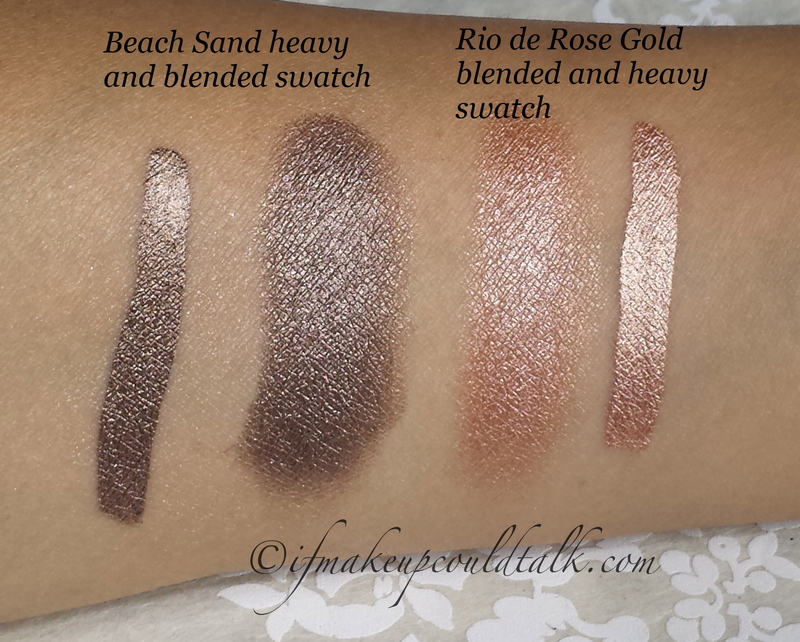 Josie Maran Coconut Watercolor Eyeshadow Beach Sand and Rio de Rose Gold swatches. 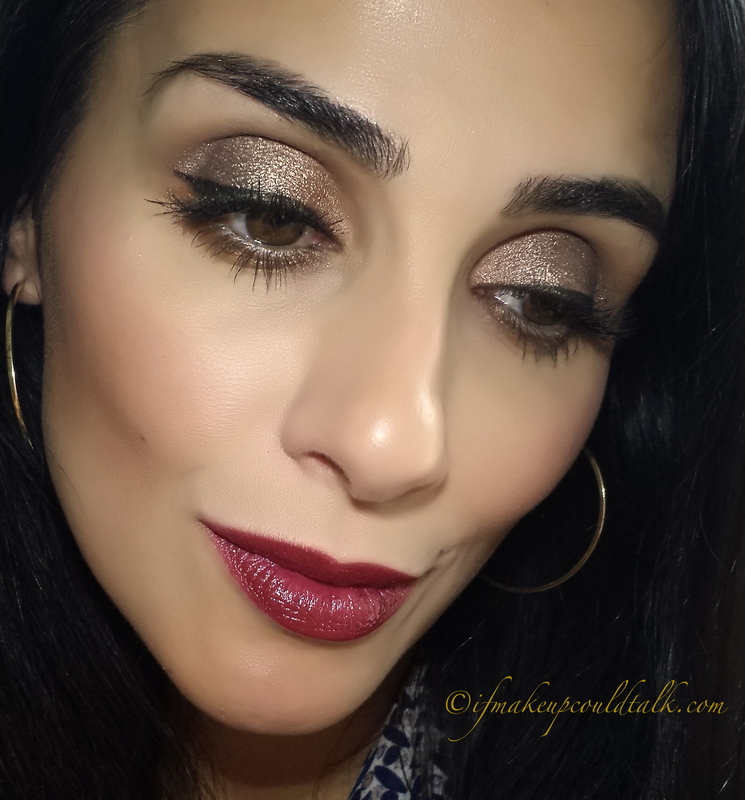 Unbelievably pigmented, very little product is needed to achieve supreme color payoff. Lasts 12 hours+ with a primer. Zero color transfer or creasing with a primer. Applies smoothly with a variety of tools (fingers, brushes and/or applicator). Smooth, intensely pigmented, long-lasting formula makes for an outstanding eyeliner. Can be used as a base for powder eyeshadows to add dimension. Beach Sand looks amazing on medium to darker skin tones. 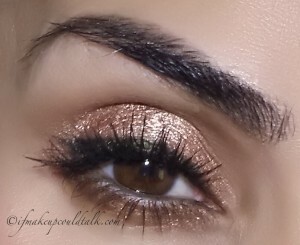 Rio de Rose Gold would look amazing on lighter complexions and those with smaller lid space. Amazing amount given, considering you only need a tiny amount for one application, one bottle is sure to last for years. Removes cleanly with minimal effort. An incredible amount of shaking is required to completely dislodge the pigment from the base of the bottle to mix with the liquid portion. When you hear the tiny agitator beads (similar to those in nail polish) moving around in the bottle (which takes awhile), then you know the solution is properly mixed. Not the best choice during busy mornings, due to the amount of shaking required. Personally, hitting the bottle forcefully against my thigh several times, works to loosen and combine the “bi-phase” formula. High metallic/foiled finish (especially Rio de Rose Gold) would not suit mature lids or an office environment. Dry time is 5-10 seconds…you must work fast for color placement. Applicator dispenses too much product for my liking. I prefer to place the color on a synthetic brush and then apply it to the lids. Josie Maran Coconut Watercolor Eyeshadow “bi-phase” liquid. 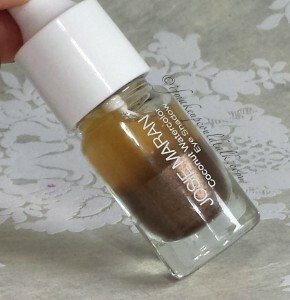 Josie Maran Coconut Watercolor Eyeshadow stuck at the base of the bottle. 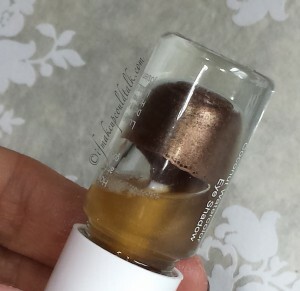 **Update: Unscrewing the top and swirling the applicator wand several times in the bottle before application helps free the agitator balls from the pigment. Josie Maran Coconut Watercolor Eyeshadow Beach Sand. Beach Sand is a color I can see myself using on a daily basis. 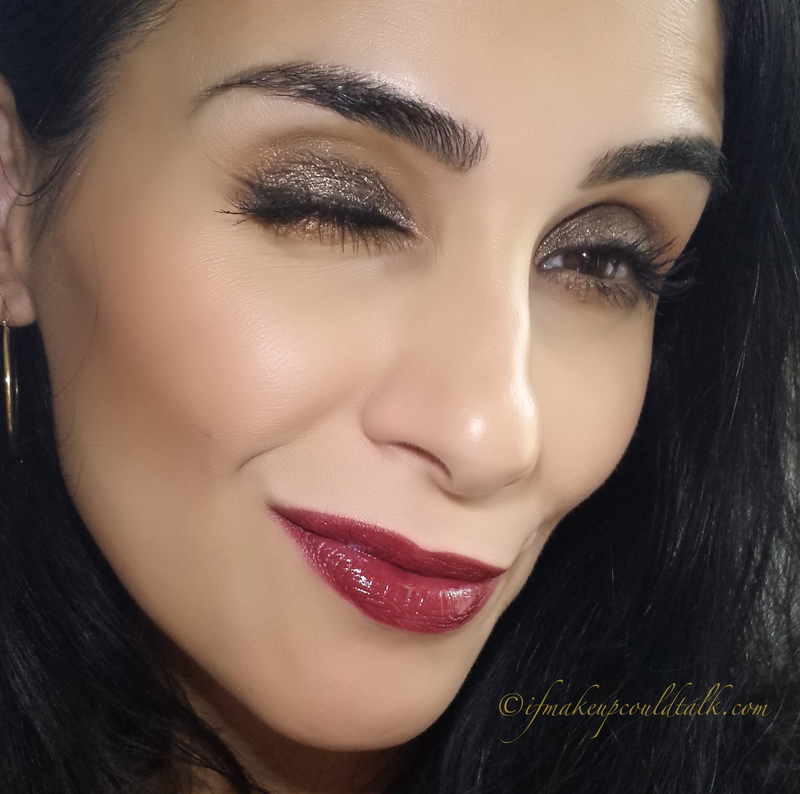 This shade also makes an outstanding base for powdered eyeshadows for added depth, dimension and longevity. Josie Maran Coconut Watercolor Eyeshadow Rio de Rose Gold. Rio de Rose Gold’s warm metallic tones proved to be too overpowering for my eye shape and skin tone. 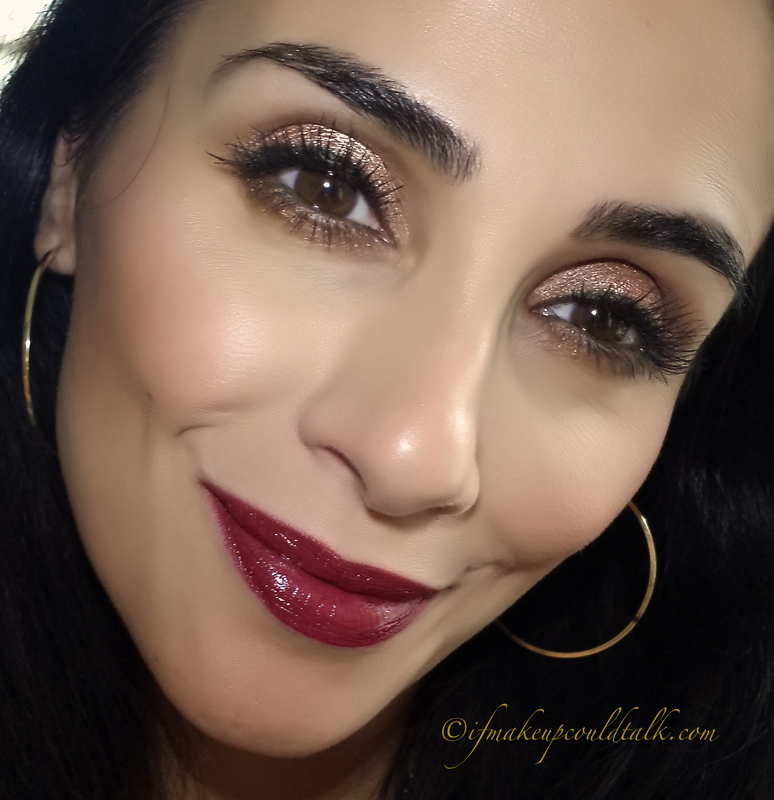 Josie Maran Coconut Watercolor Eyeshadow Rio de Rose Gold as a base and Beach Sand applied directly on top with Make Up For Ever S-556 Artist Shadow. As a solution, I applied Beach Sand over Rio de Rose Gold and the resulting hue was more befitting for a woman of my age (28 🙂 ). 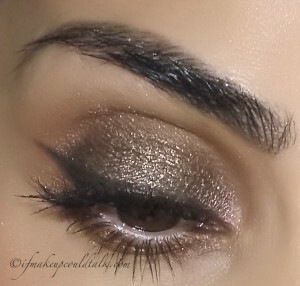 MUFE Artist Shadow S-556 was also used in the crease and outer corners. Love the results! Water**, Glycerin**, Cocos Nucifera (Coconut) Fruit Juice**, Synthetic Fluorphlogopite, Pentylene Glycol, SD Alcohol 40-B**, Sodium Olivoyl/Cocoyl Amino Acids Fructoside, Propanediol, PVP, Lactic Acid**, Benzoic Acid**, Argania Spinosa (Argan) Kernel Oil*, Phenoxyethanol. May Contain: Mica (CI 77019)**, Titanium Dioxide (CI 77891)**, Iron Oxides (CI 77491, CI 77492, CI 77499)**, Ferric Ferrocyanide (CI 77510). *Organic. **Natural. 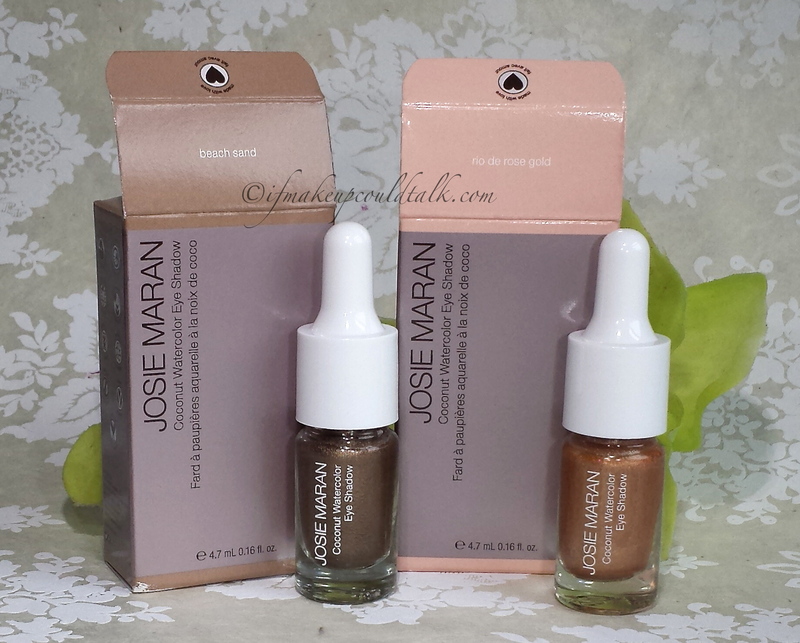 Makeup would tell you Josie Maran Coconut Watercolor Eyeshadows are lovely. If you are someone who seeks a feather lightweight formula, more natural ingredients, a metallic finish, and long wearing results then these babies are for you. Personally, I adore Beach Sand and am willing to tolerate the hassle of shaking/beating my bottle, some may not. What say you, yea or nay? Be well, stay safe and be happy. *Ifmakeupcouldtalk.com is not affiliated with any brands mentioned, all products were purchased by me. *Compensation is not given for any reviews. This post contains a store affiliate link. *Click on each photo to enlarge. *Click on the rose highlighted words to take you to a direct link to each product. *All opinions are my own and based on my experiences. *All photos are property of Ifmakeupcouldtalk.com unless otherwise noted.